Seasonal Occurrence: Common in spring; uncommon in summer. Nests in our area. Profile by Bryce Loschen: Cliff Swallows are a compact swallow with a small head and a medium length square tail. Cliff Swallows have dark blue backs and head cap, red cheeks, white underparts, and a pale orange rump. 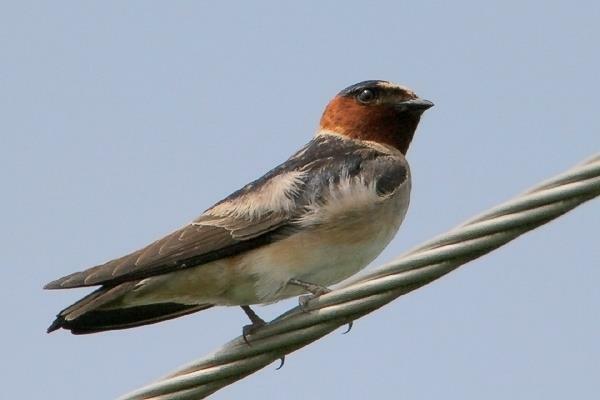 Compared to the similar looking Cave Swallow, Cliff Swallows have a dark throat, a bright white forehead, and a paler orange rump as opposed to the Cave’s darker chestnut rump. Juvenile Cliff Swallows look similar to adults, but with rusty brown faces and a dirty breast. 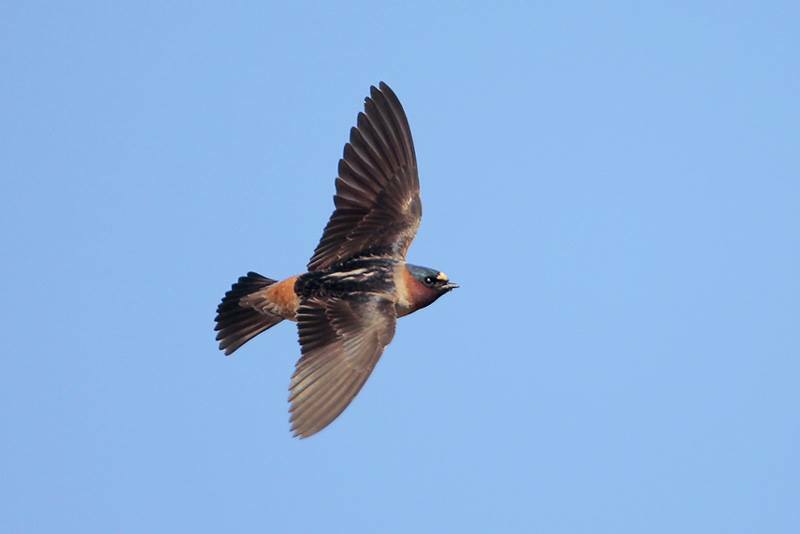 Look for Cliff Swallows swooping over open or semi-open areas especially near water such as grasslands, towns, and river edges. Cliff Swallows eat primarily insects, which they catch in flight. They like to take advantage of thermal air currents that bring together dense swarms of insects. 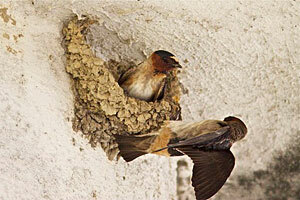 Cliff Swallows typically nest in large colonies, with nests numbering in the hundreds or even into the thousands. 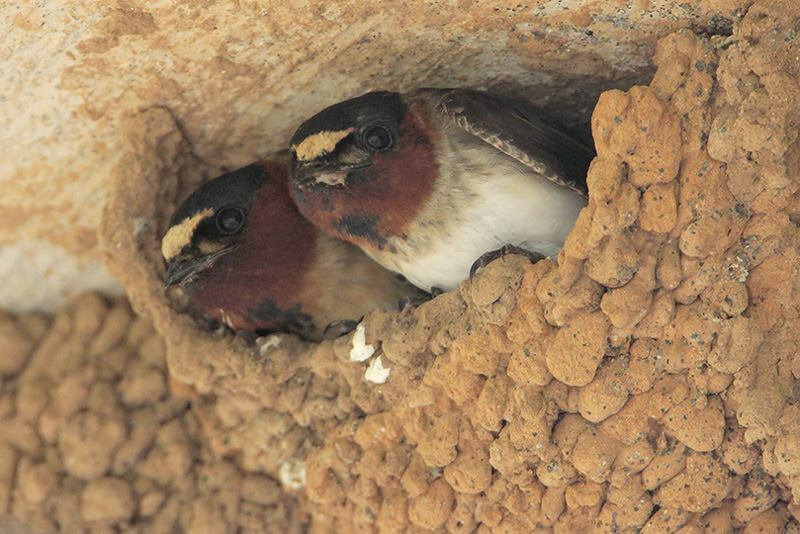 In the past Cliff Swallows nested exclusively on the sides of cliffs, as their name suggests, but now they also nest on buildings, bridges, and other man-made structures. The nest is made of dried mud and shaped like a gourd, with a large chamber for the nest narrowing into a small entrance hole. Cliff Swallows will often remain in large flocks during migration and on wintering grounds. Cliff Swallows breed throughout much of the United States, Canada, and Mexico, but are more common in the West than the East. The increase in available nesting habitat due to man-made structures has led to an expansion of their breeding range. Cliff Swallows are are long-distance migrants, coming from wintering grounds in South America. 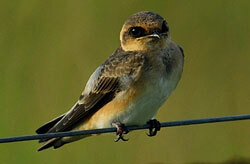 Many pass through the Upper Texas Coast during migration so look for them during the spring and fall months. Houston Audubon’s High Island Sanctuaries are a great place to come look for Cliff Swallows and many other spring migrants so come on down!